Comments: ALTERNATE EDITION: Brand New Papercover International 1st edition textbook (Textbook only). The English content is identical to the American edition. Its ISBN, cover picture, and cover binding may be different. The book printed in black/white, and the book cover which has dual languages design maybe contains restricted sales disclaimer. Expected speedy worldwide shipment with full tracking information delivery in 3-5 business days. This textbook is ideal for an undergraduate introduction to probability, with a calculus prerequisite. It is based on a course that the author has taught many times at Berkeley. The text's overall style is informal, but all results are stated precisely, and most are proved. Understanding is developed through intuitive explanations and examples. 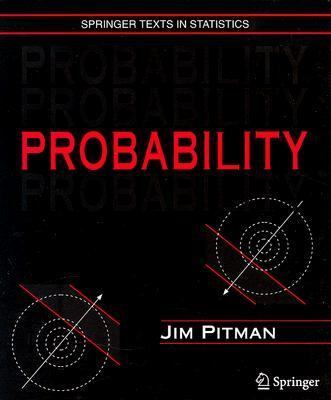 Graphs, diagrams, and geometrical ideals motivate results that might otherwise look likely purely formal manipulations.Pitman, Jim is the author of 'Probability', published 1993 under ISBN 9780387979748 and ISBN 0387979743. Loading marketplace prices 316 copies from $20.12 How does the rental process work?